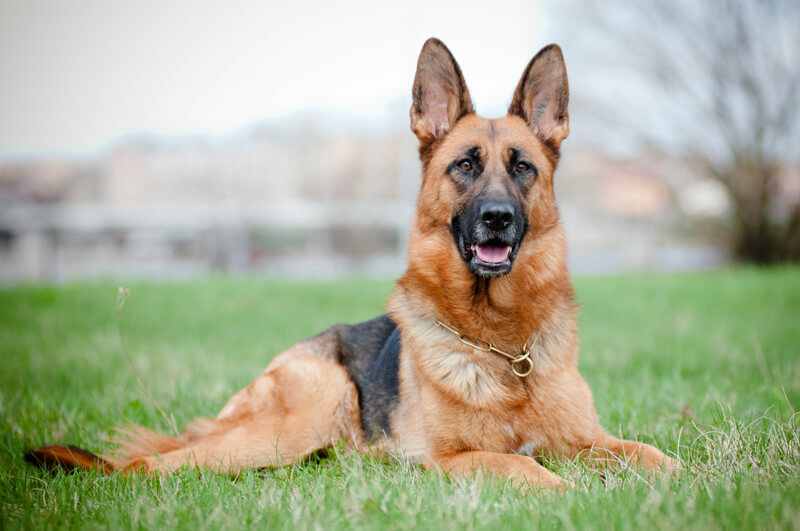 German Shepherds (GSD) are the second most popular family dog breed in America, behind the Labrador Retriever. Their versatility, adaptability, and trainability are what makes them such a popular family dog and working dog. German Shepherds have been “employed” in almost every position that a dog can hold. From drug sniffer to therapy dog and explosives detection to seeing eye dog, the modern German Shepherd has done it all and there’s a good reason why. German Shepherds are, at the heart of the breed, herding dogs. The GSD was originally bred to be a field hand and they accel at herding all sorts of livestock, from sheep to children. They have a keen sense of danger, and as a result, this breed characteristic has been used to peoples advantage throughout history. The German Shepherd is a young breed in comparison to most, with its origin story dating back only to the turn of the 1900’s. Max von Stephanitz sought to create the best herding dog, and thus the German Shepherd was born. Max purchased a dog of superior intelligence and began breeding under his self-proclaimed Society for German Shepherds. By the early 1900’s the German Shepherd Club of America was formed and became recognized by the American Kennel Club. The popularity of the breed spiked when Rin Tin Tin the movie was released by Warner Brothers. Coincidentally, the popularity of the German Shepherd rose along with Warner Brothers. In fact, it is commonly believed that Rin Tin Tin saved the company from bankruptcy. Throughout the last 100 years, the German Shepherds popularity has grown the world over and become synonymous with tasks such as police and military work. The term “Police Dog” and the breed name Alsatian are both inappropriate designations for the German Shepherd breed. If your needs involve a hardworking search and rescue dog, or a loyal family pet, the German Shepherd should be a choice near the top of your list. Germans Shepherds are a formidable sized medium breed, with males standing about 25 inches at the shoulder. Most breeds should hold their weight proportional to their frame and the GSD is no different. According to the American Kennel Club, a male German Shepherd should weigh between 65 and 90 pounds at maturity. However, breed standards are not set by the AKC. Standards are set by the German Shepherd Club of America, the AKC recognized German Shepherd breed club, which does not specify a standard weight. One unique size characteristic of the GSD is their length to height ratio. The most desirable Shepherd will be longer than taller when viewed for the side. The breed has a unique temperament that’s both bold and valiant while not being aggressive. A German Shepherd should be confident and fearless when faced with any situation or person. They make excellent guard dogs, but should not exhibit aggressive behavior if that’s not their purpose. As with any breed, training is important and the GSD is a great learner. They can be taught to protect and defend property or people, or that behavior can be a non-factor if you simply want a companion family dog. Selecting the right German Shepherd puppy for your unique lifestyle is an important choice and because of the GSD temperament, one that should take considerable time and research. German Shepherd puppies that are bred for police work don’t make the best family companions, not to say it isn’t possible to adapt. They are smart dogs after all. Despite the police dogs training to “attack” they should not do so out of aggression, but simply out of training. That being said, it’s important to be honest with yourself about what you need and want from your German Shepherd. Every dog of every breed has their own unique personality. 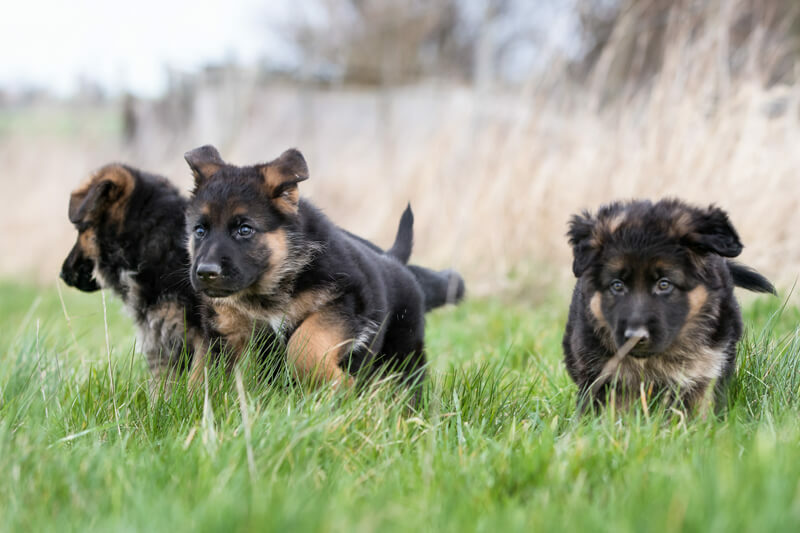 When it’s time to select a GSD, whether through adoption or purchasing a puppy, look for a dog that comes from a quality breeder. Selecting the right German Shepherd puppy is easy if you use your head and not your heart. Pick a puppy who is attentive, observant, curious, and outgoing. These are traits of the GSD and the personality you want in an adult. You should also be able to roll the puppy onto his/her back without strong opposition. This shows that the puppy is willing to trust and will go along way during training and socialization. German Shepherds have a medium length double-coat with a dense outer-coat and thick under-coat. As with most double-coat breeds, the German Shepherd is a heavy shedder during seasonal changes. The GSD will shed heavy before winter and summer, and in the case of females, may shed excessively before going into heat. It is necessary to groom GSD’s throughout the year, but during the seasonal changes when they are shedding heaviest, it is important to avoid matting, tangling, and simply to keep your house free from tumbleweeds of dog hair. It is also important to note that the German Shepherd is not hypoallergenic. Although everyone reacts differently to exposure, they are not considered hypoallergenic and should be avoided for those with serious dog allergies. When it comes to grooming your GSD, just go by smell. If he stinks, bathe him, if not don’t worry. Overbathing can cause skin irritation and washes away the natural oils that actually help keep the German Shepherd clean. There is no dog breed we would recommend not consistent training for. A common misconception is that an intelligent dog does not need formal training. That is actually the opposite mentality one should take. The smarter a dog, the more mischievous they become when left to their own devices. German Shepherds are an intelligent breed and need to be taught what’s acceptable and how to act, in fact, they desire that. Their inquisitive and protective nature also means that a fenced yard should be strongly considered. They will explore the neighborhood or protect their property, so it’s best to define that property and manage that curiosity. A fenced yard will also help with the daily exercise requirements of the breed. German Shepherds are an easy breed to train, as they are eager to please and often attach themselves personally to their handler to form a lifelong bond. Training is a great time to build a relationship with your GSD and ensure a harmonious pet owner relationship. If you have children, it’s also a great time to have your kids work with and form a bond with your new German Shepherd. The breed is known for being excellent around kids, seemingly preferring their company at times. German Shepherds are a breed of many talents. Their intelligence and trainability make them an ideal choice for almost any potential dog owner. If you’re considering a German Shepherd for you or family, take our puppy quiz to see if German Shepherds are a good fit for your unique personality and lifestyle. Still have questions about the breed? Contact us and one of our puppy experts will answer all the questions you have and help you find the breed that fits you best.